HANDLERS MUST READ ENTRY GUIDELINES NO EXCUSES FOR NOT READING!! 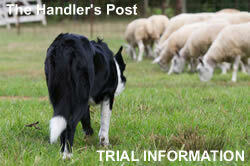 Trial Hosts, contact us now if you are interested in information on the Handlerspost.com online trial entry system. We have 2 levels of service. The basic/standard service is $1 per run. Our Full Service level is $2 per run. Please email us info@handlerspost.com for information on any of our services. We will only accept advertisements in some way related to working sheepdogs. Examples include litter announcements, puppies for sale, trained and started dogs for sale, training services, and merchandise related to sheep, sheepdogs, sheepdog trials, etc.